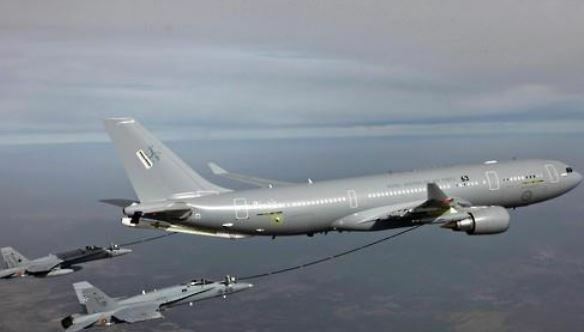 South Korea's Air Force will receive its first aerial refueling tanker this month to drastically increase the operational radius of its fighters, a military official said Friday. The official said the Air Force's first tanker plans to arrive in South Korea on Nov. 12 and receive various acceptance tests for about one month. Acceptance evaluations are a procedure to check whether the quality requirements specified for weapons and equipment delivered to the military have been met. System construction, maintenance, and the aeronautical and logistics sectors, as well as the implementation of normal air-to-air refueling, are subject to the inspection. According to the official, the Air Force will fly the tanker during the acceptance test to actually refuel F-15K and KF-16 fighters. The Air Force plans to introduce three additional tankers next year, which are all A330 MRTTs built by Airbus Defence and Space. The tanker is 59 meters in length and 60 meters in width, and is capable of carrying up to 240,000 pounds (108 tons) of fuel. Fuel is supplied to fighters at predetermined aerial locations. For that purpose, two pilots and a refueling controller operate the refueling boom. The Air Force has already selected tanker pilots, mechanics and refueling controllers, and completed their pre-training. Besides F-15K and KF-16 jets, the main powerful aircraft of the Air Force, about 40 F-35A fighters that will be introduced to South Korea between 2019 and 2021 will also be serviced by the tankers, the official said, adding the tankers will increase the air operation time by more than one hour. With a full tank, an KF-16 fighter can operate for 10 minutes over the East Sea islets of Dokdo and five minutes over Ieodo, an artificial structure in the seas south of Jeju Island. In the case of the F-15K, its operation time over Dokdo and Ieodo amounts to 30 and 20 minutes, respectively.